The installer was interrupted before MyApplication could be installed. You need to restart the installer to try again. The log file shows the following. MSI (s) (D8:20) [14:06:01:030]: No System Restore sequence number for this installation. MSI (s) (D8:20) [14:06:01:030]: PROPERTY CHANGE: Deleting UpdateStarted property. Its current value is '1'. Action ended 14:06:01: INSTALL. Return value 3. MSI (s) (D8:40) [14:06:01:060]: Destroying RemoteAPI object. MSI (s) (D8:B8) [14:06:01:060]: Custom Action Manager thread ending. MSI (c) (10:80) [14:06:01:140]: PROPERTY CHANGE: Deleting SECONDSEQUENCE property. Its current value is '1'. Action ended 14:06:01: ExecuteAction. Return value 3. Action ended 14:06:04: FatalErrorForm. Return value 1. Action ended 14:06:04: INSTALL. Return value 3. MSI (c) (10:80) [14:06:04:475]: Destroying RemoteAPI object. MSI (c) (10:F4) [14:06:04:485]: Custom Action Manager thread ending. MSI (c) (10:80) [14:06:04:505]: Product: CMS -- Installation failed. MSI (c) (10:80) [14:06:04:515]: Grabbed execution mutex. Trying installing via the command line to get a log file. That should contain the error information. You can use Wilogutl to make analyzing the log file easier. 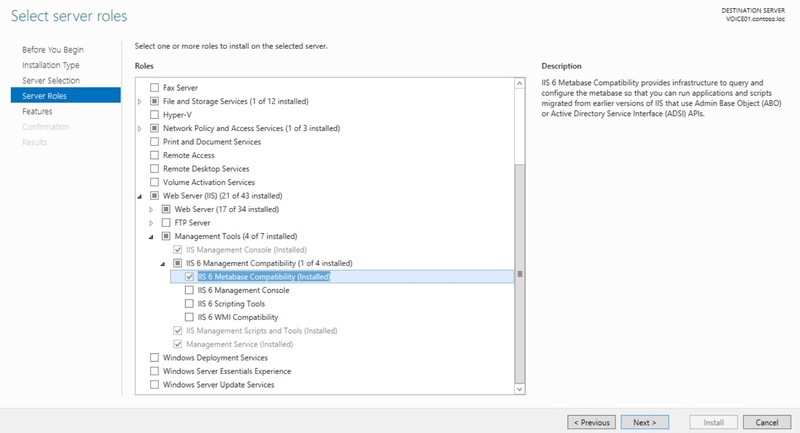 The answer was to install the "IIS Management Compatibility" server role. The Visual Studio setup project will create two files for you: an MSI file and a setup.exe bootstrapper. The latter installs any pre-requisites of your application and then launches the MSI file. When launching the setup.exe bootstrapper, a log file will be created in a subfolder of your %TMP% folder. Check for any error messages in this file. Analyzing the log should help you to find the problem. If you need any help with the error message you could edit your question and add the error message. Browse to the location for the BFE service in the registry (HKLM\System\CurrentControlSet\Services\BFE\Parameters\Policy), right click and select permissions. In the "Permissions for Policy" window, click advanced | Add. Once the "Select Users, Computers or Group" box appears, change the "From this location:" to point to the local machine name. After changing the search location, enter "NT Service\BFE" in the "Enter the object name to select" box and click "Check names" - this will allow you to add the BFE account. Not the answer you're looking for? Browse other questions tagged .net deployment windows-installer installation or ask your own question.